Fanghan is from Jilin (East city of China). She began her musical education at age seven with piano lessons. Throughout grade school, she performed and competed in a variety of music festivals and state conventions. 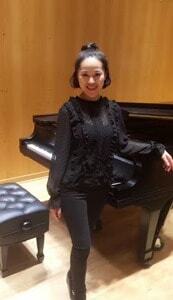 She has earned a Bachelor in Music in Piano Performance from Xinghai Conservatory of Music (one of the famous China Conservatories), Master Degree from Boston University, and is currently pursuing a Doctoral Degree in Piano Performance at the University of Minnesota. At Boston University, Fanghan studied Classical piano with Victor Cayres. The years of studies at the Academy were devoted to widening her piano repertoire. She regularly performed in recitals, and completed several recordings for fellow collegiate composers. As part of her Piano Pedagogy courses, she began to be a piano teacher in Quincy’s Elementary School in Boston. She realized that she had a passion for teaching children and sharing the gift of music, and has been teaching ever since. Fanghan is a dynamic and energetic piano teacher with five years of experience in elementary and junior high school music instruction. She participated in school functions requiring a pianist and selected gifted students to perform in community events. Fanghan is a highly motivated educator of music and adept in creating exciting and entertaining leaning environments.